Kinshasa 09-04-2019 Politics - The President of the Republic Félix Antoine TshisekediTshilombo returned to Kinshasa Monday from Washington, United States of America, where he made an official visit from 3 to 5 April 2019, as part of strengthening bilateral relations between the two countries. The President of the Republic returns to the country reassured to have warmed the relations between the United States and the DRC, of the support of the USA for envisaged reforms, after having laid the bases of a multiform cooperation and their support in the fight against corruption, the mismanagement and impunity that plague the country. The Head of State, during the a conference organized by cercle de réflexion "Council on Foreign Relations", invited American businessmen to invest in the DRC while ensuring a conducive business climate. The President of the Republic took advantage of his stay on American soil, 0to visit the memorial dedicated to the famous African-American pastor Martin Lutter King, a nonviolent activist for the black civil rights in the United States. He also visited the Georges Town University which trained the basketball player Mutombo Dikembe, of Congolese origin. The Head of State who was hailed by the Under-Secretary of State for African Affairs and by US Secretary of State Michael Pompeo for the progress he has made so far, said he spoke with them about the leadership of the State Department and US Business, the future of relations between the United States and the DRC and their common interest in a partnership aimed at providing the Congolese people with prospects for prosperous life. In the US Senate, Félix Antoine Tshisekedi was congratulated by US Senator James MoutainInhofe, chairman of the Arms and Armaments Commission, who also hailed the DRC's progress since his accession at the head of the country. On the revival of cooperation between the DRC and the country of Uncle Sam, the Trump administration has expressed the need to support the program of President Félix Antoine Tshisekedi Tshilombo and develop the partnership with the DRC, a strategic country of Central Africa emphasizing that "the US want to see what they can do to promote peace and security in the DRC and support the DRC, especially in the fight against corruption." About this mission, Félix Antoine Tshisekedi met Belgian Foreign and Defense Minister Didier Reynders and Managing Director of the International Monetary Fund (IMF) Christine Lagarde. With Didier Reynders, they agreed on the return to normal of the bilateral relations that had been deteriorated at the end of the Kabila era whereas with Christine Lagarde it was about the resumption of the DRC-IMF cooperation suspended since 2012 due to the lack of transparency in a mining contract between Gécamines and an American firm. 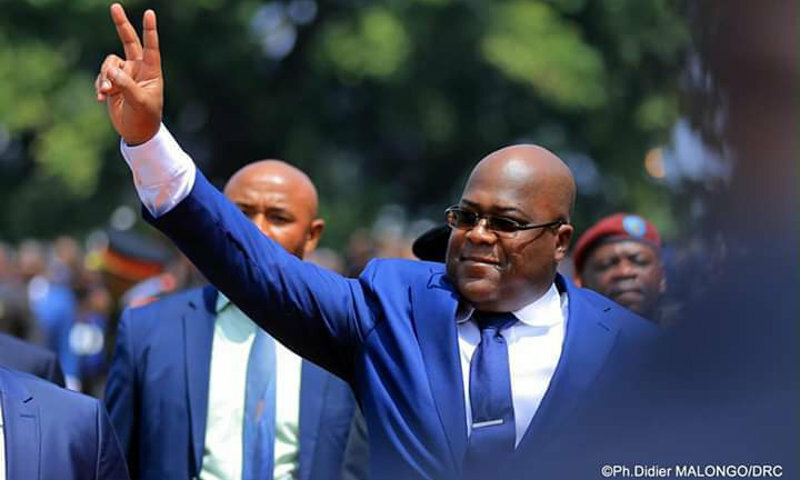 We note that the United States of America has welcomed the end of the official mission of Congolese President Félix Antoine Tshisekedi by 21 guns and a parade of honor at the Arlington Memorial where he lost with his wife, Mrs. Denise Nyakeru, at the grave of the late President John Kennedy.